When someone is ‘a fish out of water,’ it means they are in a situation that their unfamiliar with, thus they look out of place and uncomfortable. Example: Bill wanted to get fit, so he decided to finally go to the gym. However, Bill had never been to the gym before, so once he got there and saw all the equipment, it was all very intimidating to him. He had no idea what half of the these machines did, nor did he know how to use them. Thus, while Bill was at the gym, you could say that he looked like a fish out of water. Fish are right at home in the water, it’s where they live after all. They are most comfortable there. So what happens when take one out of their “comfort zone,” so to speak, and drop it on dry land? Things go south very quickly for them. 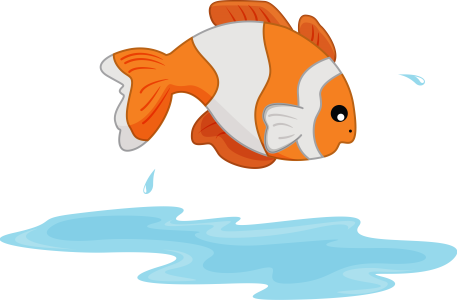 Since fish cannot breathe out of water; it doesn’t take long for them to suffocate and die. But how long can a fish survive without water? This depends on what kind of fish it is. Some of them die within a few minutes, while others can go on living for a few hours. If you’ve gone fishing before, then you’ve probably seen what a fish looks like. out of water. They helplessly flop around as they desperately try to get back to their watery home. Now here’s the point of all this: While the fish is flip-flopping around, you can obviously tell it’s uncomfortable. The fish is clearly not suited for dry land, so it looks out of place. Thus, a comparison is made: Someone in an unfamiliar situation (like Bill from the example) is like a fish out of water; both the fish and the person look completely out of their element. Now let’s move on to another question: How old is this expression? That means this phrase is over 530 years old, at least! Tim visited his grandpa’s farm. He wanted to help out with some farm work while he was there, but Tim had no experience with this kind of work, so he just looked like a fish out of water. I tried playing a sports video game, but I was a fish out of water; the controls were tough to get a handle on. 3. Sea Turtles: Several hours, however, if they are sleeping underwater, they can hold their breath for about 5-7 hours.